Today was a rainy day here in Cincinnati so I decided to make some Slow Cooker Breakfast Casserole for dinner. I let all of you know how I had received a few crock-pots for Christmas and I really want to give them a try. Breakfast for dinner on a cold and rainy winter day just seems perfect. It has been quite awhile since we have had breakfast for dinner. We use to squeeze one breakfast for dinner meal in our menu once per week. I am not quite sure why it has been so long. I remember growing up it was a weekly tradition. I always enjoyed helping choose which breakfast foods we would be having. I will admit French Toast always seemed to be my breakfast of choice (check out my French Toast Cups, Slow Cooker French Toast and French Toast Roll-Ups ). As an adult there is nothing better than a western omelet. 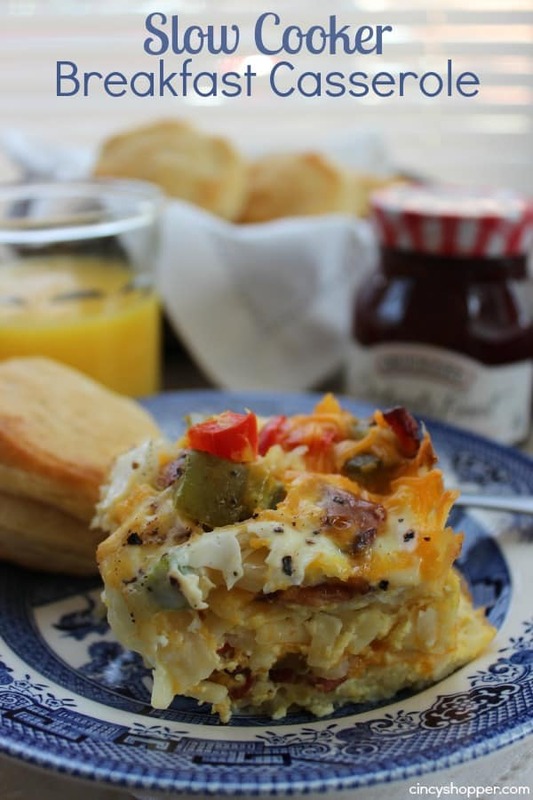 This Slow Cooker Breakfast Casserole reminds me so much of my favorite omelet. 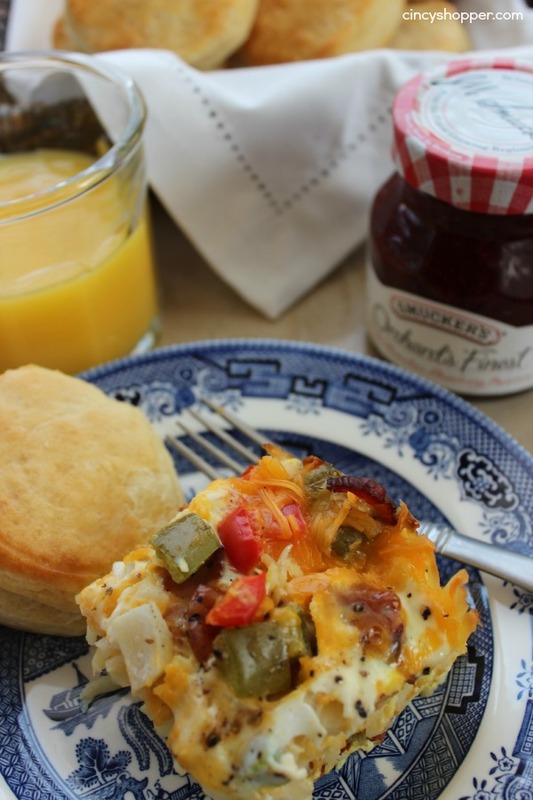 This slow cooker breakfast recipe is one you will want to give a try. I have been wanting to make one of these for quite some time. I am really upset that I have held off making it this long. The hubby was liking it so much I think he went back for thirds or maybe in fourths, ha ha! I am thinking of trying sausage next time instead of the bacon (he prefers sausage so, I will really make him happy next time I make this). I ran to Kroger and picked up some Orange Juice and Biscuits this morning (I was amazed they were both on sale) to serve up with this yummy dish. I honestly think it was great all by it’s lonesome. 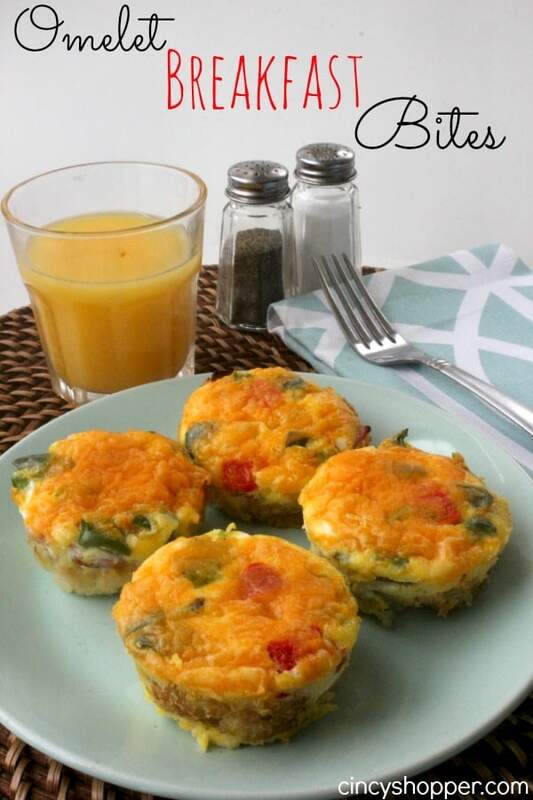 Eggs, bacon, veggies and cheese. oh Yum! Just perfect. If you are needing an easy go to slow cooker meal for breakfast or for dinner, you will want to whip this one up. I like that you can cook it up in just a few hours or toss it in the slow cooker overnight and have it ready for morning. Also, the main process that took most of my time was cooking the bacon and slicing the veggies. I was thinking that we could easily use pre-cooked bacon and pre-sliced veggies if we are rushed with time. 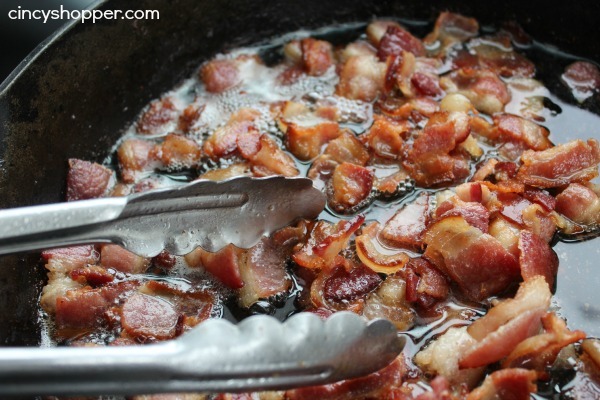 Cut bacon in to small pieces, cook and drain (You could use precooked bacon to speed up the process). Add half bag of hash browns to bottom of slow cooker. Add half your green and red peppers. Add remaining green and red peppers. In a medium sized bowl beat eggs and milk together. 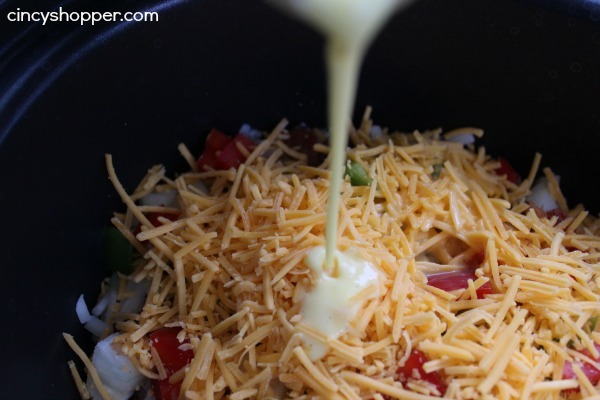 Pour egg mixture over your casserole. Cook on Low for 4 hours or warm for 8 hours. 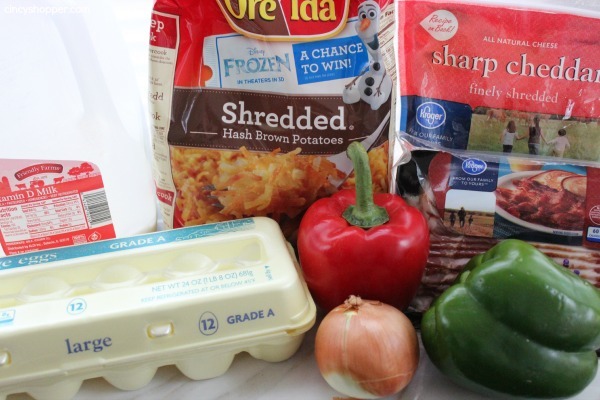 As you can see, this Crock-Pot Breakfast Casserole is super simple and all the ingredients go so well together. You could add or subtract some ingredients to make it just perfect for you and your family. I honestly am not quite sure how many servings we actually had with this dish. I would say you could easily serve 8-10 with this crock. Great for a big family gathering breakfast, brunch or like us dinner! Do you and your family enjoy breakfast for dinner too? Winter always gets me in the mood for a warm crock-pot meal. The cold also has a tendancy to crave comfort foods. 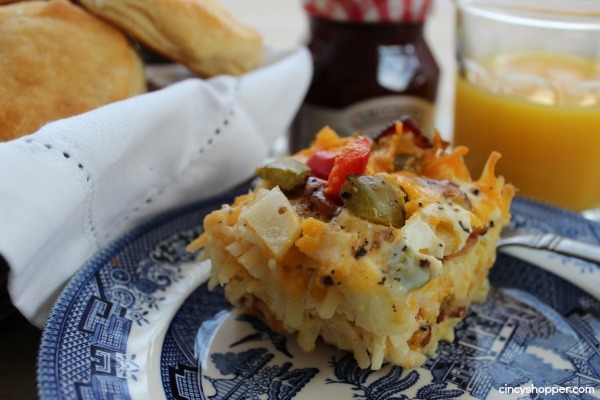 I think this slow cooker breakfast casserole satisfied those cravings. 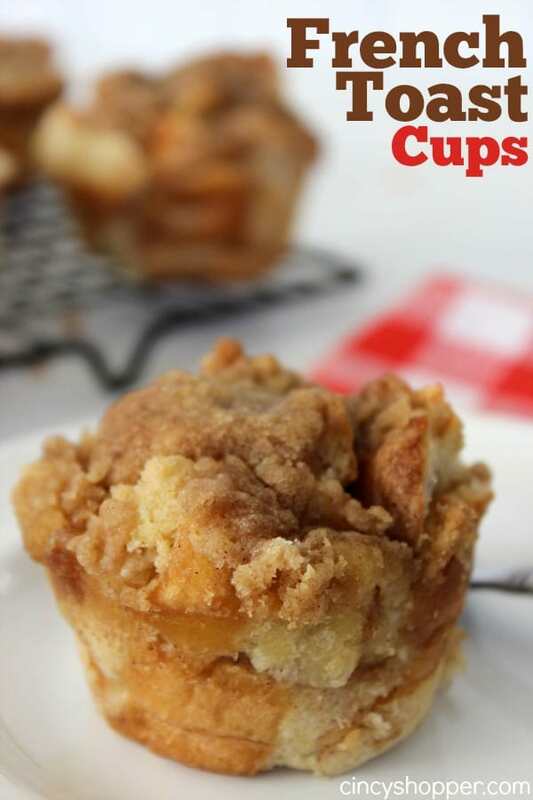 Be sure to let me know if you give it a try and if you put any additional spins on the recipe. Looking to try other Slow Cooker Recipes? If so, be sure to check out my Slow Cooker Bean Soup Recipe and other recipes here. Also, be sure to follow my Slow Cooker Pinterest Board to follow all my slow cooker recipe additions I will be sharing in the upcoming weeks. Anything made in the crock pot is great! I’d love it if you’d link this up to my very first linky party! 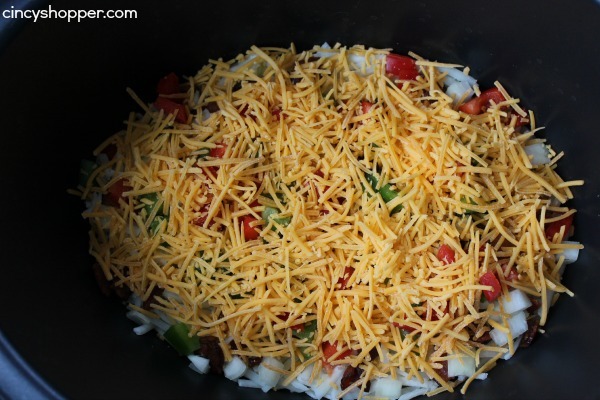 I would love waking up to this casserole, it looks delicious! Thanks so much for sharing with Full Plate Thursday and have a great weekend! oh, I can only imagine waking up to this delicious smell!! I love breakfast casseroles! Yours looks yummy! Thanks for linking up for Friday Favorites. I’m featuring you this week. Hi Jeremy! I am so sorry to hear that this recipe did not work for you. I made this recipe exactly as stated. I used a 6 quart slow cooker. Slow cookers can vary from cooker to cooker. The first time making slow cooker recipes is always trial an error as the cookers do all heat differently. I cooked this on warm 100% positive ( I had received in a brand new slow cooker and did not know how it would cook so I used the warm setting as I was afraid it would “over cook”) . Your cooker may not cook as hot as mine does and needs to be placed on the low setting like you stated if it did not cook thoroughly. Once again I am sorry this did not work for you. We have cooked this a few times since and it has turned out wonderful for us. I was thinking the same thing. I would never cook anything on warm. Yep, it doesn’t work. I tried it. Thank you for the base of the recipe though, definitely will make again but tweak even more :D. Merry Christmas! I also cooked my breakfast casserole for 4 hours on Low and eggs were runny and not cooked. That’s what I get for trying a new recipe on company! I had the same problem! I left it on warm for 9hrs. and it didn’t cook at all. I melted the cheese and when you first looked in, it seemed to be done, until you moved it ever so slightly , then you realized it didn’t cook the eggs at all!! Yes, very disappointing for me too. I made this for a charity event and am sitting here waiting for it to cook because of this. Seriously? Mine did the exact same thing! I wish I saw your comment last night. I had the same issue. I went to work with it… Not cooked. Had to make plates and microwave it. If I was to double this recipe, or even increase by 50%, do you believe I could still cook in the 6 quart cooker? Hi Candice! You could always give it a try. This recipe can be finicky so, trial and error. But trust me it is worth it. I had quite a bit of room in my slow cooker but, you may have to worry about it cooking evenly. If you do try, be sure to let me know. How does this dish refridgerate or freeze? I could make half the recipe but it will still be too much for one person and I would like to have it in the fridge to heat and eat later. Do you know what settings if cooked in the oven? Is this made with Southern Style or regular frozen hashbrowns? It looks amazing! I want to make it and add mushrooms (like a Western Omelet). I would love to try this but can’t buy frozen hash browns where I live. Do you think it would work with fresh shredded potatoes? Looking forward to giving it a go. Thanks for sharing. Hi Alayna! You could definitely give it a try. I would possibly shred them and freeze them if you are wanting to try the recipe to be exactly as I have. Be sure to let us know if it works out using fresh potatoes. Thanks! I let you know how it works out. Hello Jen. I followed this receipe to a tee and have a very nice hot crock pot and although the top looked done and smelled tummy, after 8 hours on warm, the eggs never cooked. I just stuck it in the oven hoping to cook the eggs. I think using it on low for 8 hours or high for 4 would probably work better or even in a casserole dish in the oven. Thank you for the receipe, I just thought I’d share my experience as well and thoughts on how I may try it again. This sounds great for a group! One question: my crockpot is an 8 quart. Would that be too big? I’m cooking this now and am a bit nervous about the warm setting. I think I will put on low for an hour or so to be safe. Poured Bourbon steak marinade over the hash browns. could I use evaporated milk instead of regular milk? Okay so it was delicious but I won’t use spinach or marinade again as they made it way too soupy! It did firm up after 10 hours on warm though. I also would use more cheese. I halved the recipe so only used 6oz cheese for 6 eggs but still wasn’t cheesy enough. I recommend an 8 oz bag for ) eggs. I will get a better quality cheese too. The bargain stuff didn’t hold up to all the liquid. I did the 8 hrs on warm as well and the eggs never hardened :/ i have it on high now to see if i can get it to harden but might just be throwing it out. ill be doing it on low or even medium next time. Have family & friends coming early morning. Want to give them a good breakfast with out a lot of stress. Thank u for this. U saved my day. This did not work. I was wary of cooking the eggs on warm so I cooked them on low for two hours and them warm for the remaining six hours and it is like soup. I am throwing it out. The Jimmy Dean site says to cook on low for eight hours or high for four. I would like to try this again but I don’t want to waste any more food. 1. After cooking the casserole on warm for 8 hours it was still very, very water. I put the crockpot on High for two more hours and was able to it cooked up. The eggs didn’t really hold, however. I think the cook time needs to be more adjusted for this recipe. 2. It was tasty, but I agree with some of the other comments that it should have more cheese. It was pretty potato heavy. 3. I’d also add some additional spices to give it a little more flavor. This breakfast entree was awesome! I modified the recipe, olive oil to coat crock, 8 fresh red potatoes shredded, layered with chopped ham off the bone with original suggested ingredients . Increased the cheese to 16 oz. then, in the egg mixture added 2 tablespoons of yellow mustard, salt and pepper. Cooked at low temp for 7 hours & it was a perfect texture. Had quiche like firmness. Traveled with it & kept warmed 15- 20 minutes til serving. Many compliments & no leftovers! I brought this to an office breakfast potluck and it went over pretty well. I reduced the hash browns to a 20ounce package of fresh shredded potatoes. I also reduced the milk to 1/2 a cup since folks said it was soupy, but it ended up a little dry, so I will use 1cup next time. I cooked it on low in my 4 quart crock pot for 8 hours. A knife inserted in the center came out clean after 7 hours, so I probably could have put it on warm for the rest of the time. I think next time I will add chopped broccoli. Going to try this, looks so good, wish you had a print option! It was super good. I homeschool and feed my kids hot breakfast so it is wonderful to save time by having a crockpot ready to go. 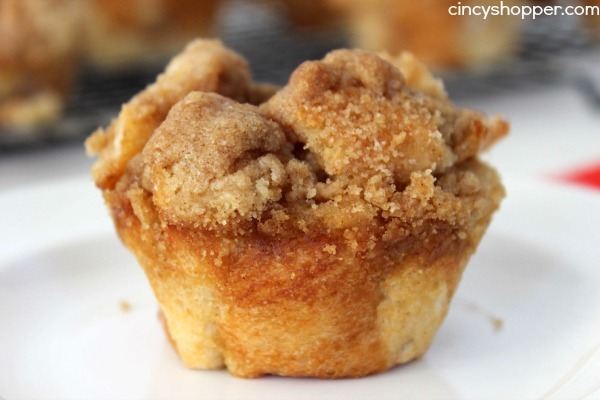 We have this recipe and steel cut oats in the crock pot every single week. So so good! Very yummy. I wasn’t sure about the “cook on warm for 8 hours” but it was great! It didn’t burn…. I used breakfast sausage ( 1 tube) and a 1/2 stick of choirzo sausage to spice it up a bit… yummy! I also used tator tots as that is all I had… worked out great… I will be making it for my next big holiday event!! Halloween party here we come! This looks so good, and a nice stick to the ribs breakfast! I actually wanted to make this & bought ingredients. But could never find a print button to print the recipe so gave up. Why did you need to print a recipe? Chop the items and then layer them… pour scrambled eggs and milk over. It is worth the making. what size slow cooker would you recommend ? – Cooked on Low for 3-4 hours, then when it started to look brown around edges, turned to Warm for maybe 5-6 more hours. It probably would have been OK on Warm the whole time. It was a hit at my work potluck breakfast! This did not cook properly on warm. After 8 hours, the potatoes were not done and the liquid did not absorb. I had the same problem on warm setting of crock pot. I assembled it at 12:30 am so I could take it to church at 9:30 am. I failed to check it at home (my bad), so at about 9:15 at church I checked it and it was Not even close to being done. Luckily, we had a microwave. But it took 15 minutes to cook in microwave checking it contantly and had to stir it up a lot. It tasted ok, but still a little watery and looked mushy. I may try again, but only when I have time to babysit it so I know it will be cooked. I am thinking it would take 8 hours on low setting or maybe 5-6 hours on high. I tried this again but cooked it on low for about 8 hours. Perfect and delicons. It’s a definite keeper. My granddaughter made this for a crowd Sunday morning. She had to cook it about an hour more than recipe called for, but it turned out wonderfully and was delicious! Would this work with just egg whites? I did this in the Ninja on low and it was cooked in less than 2 hours. Switched over to warm. Hoping it’ll be just right by the time people arrive in 2 hours. Update: Although the eggs had set up, I left it on low for two more hours and it turned out pretty good. I think next time I would definitely saute the peppers and onions before putting in the slow cooker. Otherwise, good recipe, very easy. As others have mentioned, lots of potatoes, but I like potatoes. Looked soo good I wanted to try it. Unfortunately after having it cooked on warm for 9 hours. The eggs are still runny and uncooked. I suggest cooking it on low and checking it early before everyone expects to eat it. Would you be able to freeze this after making it? How would you wrap it up^? I’ve made this several times for my family & for my husband to take to an office breakfast. I cooked mine on high for 4 hours & it was perfect. The only complaint was that I didn’t make 2 of them…lol. I’m making 1 for family I’ve got it all ready except for eggs & milk. Usually I use 1/2 & 1/2 when I make scrambled eggs. Has anyone tried that with this recipe? With everything that’s in it I don’t think the extra calories will matter. I’ll let y’all know how mine turns out if I use it. I’ve had the same problem as several others have said. We cooked it in warm for nearly 12 hours, and it’s as runny as water. Very disappointing as we were bringing it for a brunch. You should clarify in the instructions that some (most) slow cookers need to be on a higher setting than warm so that people can decide for themselves how to cook it. I made this following recipe but adding 1 cup extra milk and a layer of thinly sliced bread, and cooked it on LOW, not warm, for 8 hours in my large RIVAL crock pot, and it was perfectly cooked. I’ve made this several times and have one in a crockpot now. The 1st time I made it, it was not only for for my husband to take to a work place breakfast during the holidays of 2014. It was also untested, untasted and…for the police dept. I was not only asked for the recipe I was also asked to send 2 for every breakfast they have!! It’s such a good way to start off the day. On the last day of his work week or over a long wkend, I’ll fix a big meal with plenty of leftovers, make one of these & then no more cooking for me!! I also love that there’s so many different ways to change it up. Definitely a keeper!! So I attempted to make this Christmas morning for the whole family, my in laws were here and was trying to make a good impression. The eggs did not set, did not want to risk food poisoning so threw the whole thing out and we all had cereal. Was pretty disappointed considering how much food was wasted, and it was Christmas morning. But I have hope, this looks really delicious. So I am attempting it AGAIN tonight! But putting the slow cooker on LOW not Warm. Here’s hoping it turns out!! Warm does not cook this recipe. Do not cook it on warm, use a higher setting or you’ll have raw egg soup after eight hours. So glad that I read the reviews. I haven’t tried the recipe yet, but will definitely cook on low for 8 hours. Can I use a crock pot for this . I don’t have a slow cooker. Or can I bake it in the oven in the morning.